20 Bible stories come to life on 1.5 hours of DVD. Some of the greatest stories in the Bible are narrated by Max Lucado, Joni Eareckson Tada, Twila Paris, Lloyd John Ogilive, Roy Clark, Steve Green and others. Plus each story is accompanied by a sing-along song with words that appear on the screen to help a child remember the Bible stories. - Publisher :20 Bible Stories come to life on 1.5 hours of DVD. Some of the greatest stories in the Bible are narrated by Max Lucado, Joni Eareckson Tada, Twila Paris, Lloyd John Ogilvie, Roy Clark, Steve Green and others. Plus each story is accompanied by a sing-along song with words that appear on the screen to help a child remember the Bible stories. 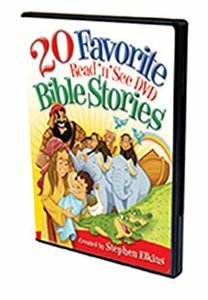 About "20 Favourite Read and See Bible Stories"
:20 Bible Stories come to life on 1.5 hours of DVD. Some of the greatest stories in the Bible are narrated by Max Lucado, Joni Eareckson Tada, Twila Paris, Lloyd John Ogilvie, Roy Clark, Steve Green and others. Plus each story is accompanied by a sing-along song with words that appear on the screen to help a child remember the Bible stories.